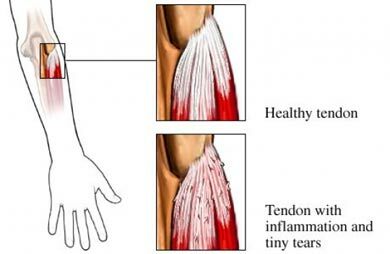 This condition is often called tennis elbow, but it is not restricted to people who play tennis. It can also occur in people with jobs that require repetitive motions such as roofers and carpenters. Lateral epicondylitis is caused by damage to a tendon. You will be asked about your symptoms and medical history. You may also be asked about your recent physical activity. X-rays are not usually necessary. However, an x-ray may be needed if the doctor suspects other problems. Regular ice application may help decrease some discomfort and swelling. You may be referred to a physical therapist. You will learn exercises that may help reduce your symptoms and maintain strength. Certain injuries may require a brace. It is placed on your forearm. This brace limits the force of your forearm muscles on the tendon. The doctor may inject cortisone into the tendon. This may help to reduce pain and inflammation in the short term. Unfortunately, the injection may not help in the long run. Heat may be helpful when returning to physical activity. It can decrease the stiffness in the muscle or tendon. Start gentle stretching of the wrist and elbow as advised. Do not push the stretch to the point of pain. Maintain strengthening exercises for the forearm muscles. Gradually return to the sport. Talk to a sports professional to adjust technique, if needed. Keep your arm muscles strong . This will decrease the stress on the tendons. After a short warm-up period, stretch out your arm muscles. Learn the proper technique for activities that require forearm motion. Chumbley EM, O'Connor FG. Evaluation of overuse elbow injuries. Am Fam Physician. 2000;61(3):691-700. Nirschl RP, Kraushaar BS. Keeping tennis elbow at arm's length. Phys Sportsmed. 1996. Nirschl RP, Kraushaur BS. Assessment and treatment guidelines for elbow injuries. Phys Sportsmed. 1996;24. Tennis elbow (lateral epicondylitis). Ortho Info—American Academy of Orthopaedic Surgeons website. Available at: https://orthoinfo.aaos.org/en/diseases--conditions/tennis-elbow-lateral-epicondylitis. Updated July 2015. Accessed November 15, 2017. 11/8/2006 DynaMed Plus Systematic Literature Surveillance http://www.dynamed.com/topics/dmp~AN~T116846/Lateral-elbow-tendinopathy : Bisset L, Beller E, et al. Mobilisation with movement and exercise, corticosteroid injection, or wait and see for tennis elbow: Randomised trial. BMJ. 2006;333:939. 10/26/2010 DynaMed Plus Systematic Literature Surveillance http://www.dynamed.com : Massey T, Derry S, et al. Topical NSAIDs for acute pain in adults. Cochrane Database Syst Rev. 2010;(6):CD007402.